Gail Shive is a Laramie, Wyoming based artist who uses acrylic painting to create original artwork that will be on display and for sale at the 6th Biennial Touchstone Laramie Art Exhibition hosted by the Laramie Artists Project. 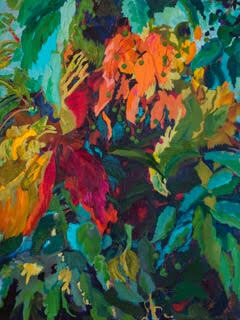 Gail W. Shive's two dimensional acrylic paintings emphasize beauty and the lusciousness of nature, she paints opposing color schemes helping us feel the power available there. While hiking, biking, skiing and gardening Gail's camera is always ready to capture and collect images that will later be turned into paintings. People report that her art stirs and uplifts them. It is enjoyed by collectors world wide. Her work has been shown from New Mexico to Ithaca, New York, as well as with the Laramie Art Project, Touchstone 2012-2016. She received Sweepstakes and Popular Awards from the Wind River Valley Artists' Association of Fremont County Wyoming, as well as a Fellowship Exhibit provided by the Wyoming Arts' Council for her Screaming Women's Purses series. She was born and raised on a mid-western farm. Gail received her master's degree in Speech-Language Pathology from the University of Wyoming. She is currently working and residing in Laramie, Wyoming. You can see more of Gail's work online at www.gailshive.com or contact her at 307 745 4145. This is Gail's 2nd time exhibiting at Touchstone Laramie and her 6th year as part of the Laramie Artists Project. This year she will exhibiting new original paintings for the 6th Biennial Touchstone Laramie Art Exhibition on November 10th and 11th, 2018 at the Fairfield Inn and Suites in Laramie, Wyoming.